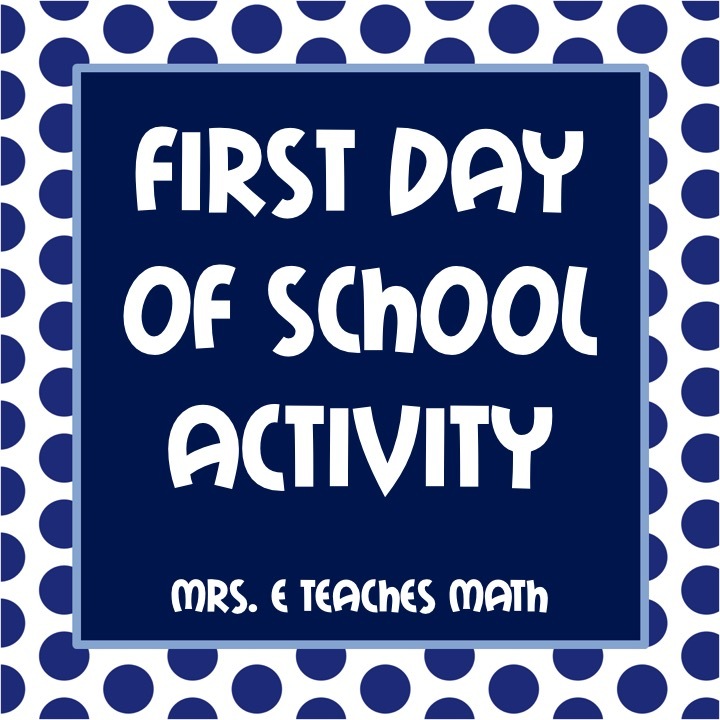 I can’t believe that today was the first day of school! This summer FLEW by for me. I’ve never done anything fantastic on the first day of school. I usually have the students go around the room and introduce themselves, go over the syllabus, etc. Ugh, I hate it. This year I decided to do something totally different. My goal was for the kids to start working and thinking, without actually starting my curriculum. We only have 30-minute classes on the first day of school, so I don’t have a lot of time. First, my students came in and found their desks. I printed their names on strips of paper so that I could easily assign seats. Their bellwork was posted on the board. My kids even have bellwork on the first day. 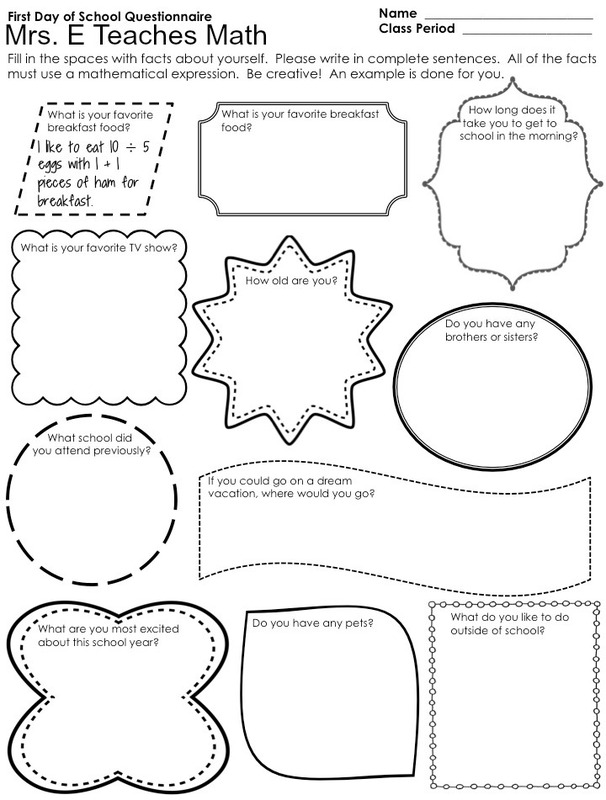 I used this sheet for their bellwork, whatever they didn’t finish was homework. This year I’m teaching Geometry Honors and Algebra 2 Honors. My honors kids (and their parents!) would have a heart attack if I didn’t give the syllabus on the first day and talk about expectations. So, I handed it out and talked about it for maybe 5 minutes. I also handed out the calendar for the first unit. I liked using these brain teasers because I could make them take as much (or as little) time as I needed! When there were a little more than 5 minutes left in class, I quickly wrapped up and introduced the idea of an exit ticket. I don’t know if any of my students have done them before. I had them write a Tweet using #Mathis as their inspiration. I totally ripped this idea off of Sarah Hagan at Math = Love. I made my own paper for the kids to write their Tweets on. I wanted something to help them count the characters, but some of my freshman can’t write in little boxes to save their life, so I just gave them blanks to write on. I had three kids ask me what Twitter was. #Facepalm #TeacherFail I told them to just to fill in the blank: Math is _______. I totally love how cute it turned out! I hung some on the wall. 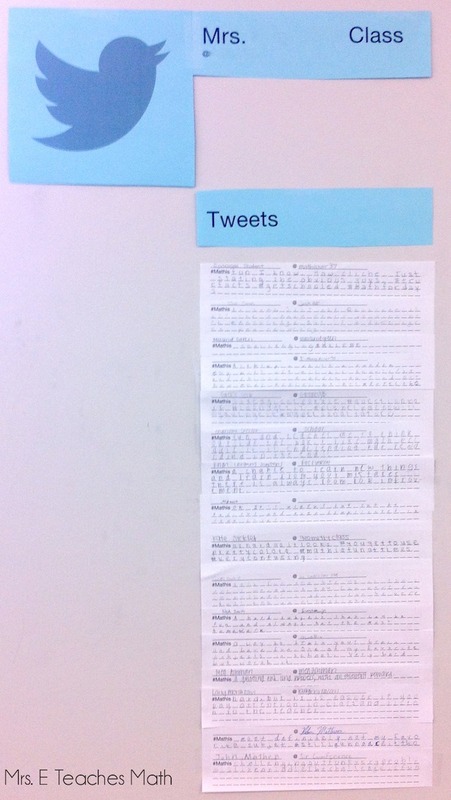 I would have used too much tape hanging 70+ Tweets. I loved this one, thanks. 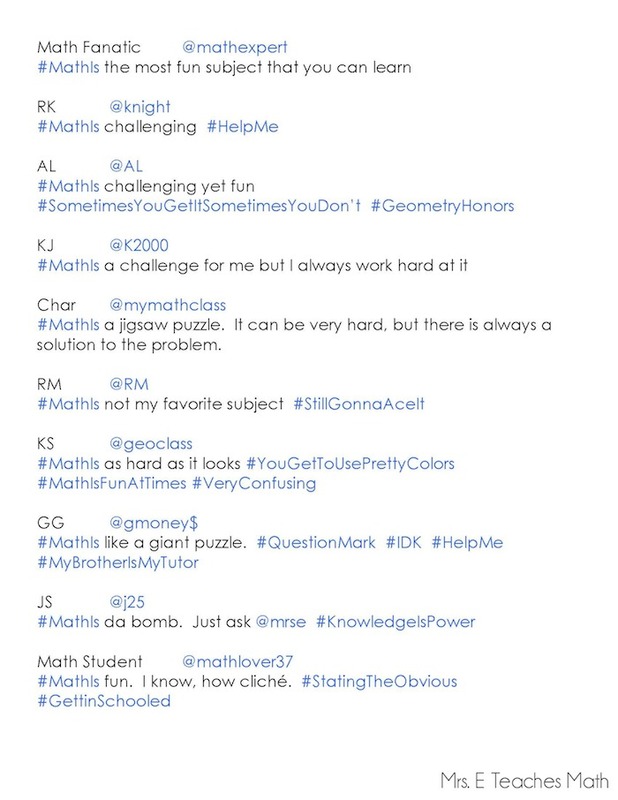 My favorite one was "Math is as hard as it looks!" Haha! I love this. I will try this. Thank you!!! !